This week we've been running full length simulations on the dyno. 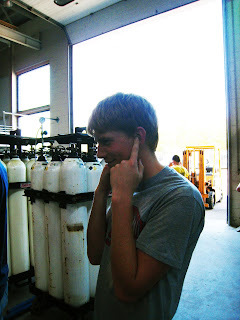 Compared to the relatively quiet resistor load bank testing, earplugs are a necessity here! OSU's 1000 horsepower dyno setup allows the team to run the motor at full power and simulate a complete Bonneville run, without the salt of course. So far we've been able to sustain 500 kW (nearly 700 horsepower) and are constantly pushing for more. Push for more!!! Good luck at the Salts with an amazing new trailer and fine-tuned stream-liner.